In a kadhaiadd ghee bring it to boil then reduce the flame and add besan mix well till changes its colour. 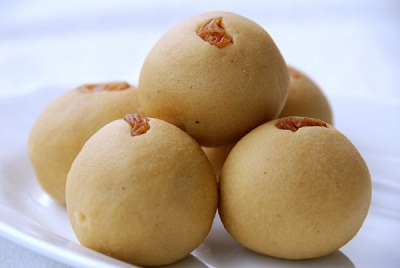 Once the besan is done then add sugar and cardomam powder mix well; Immediately switch of the flame and let it cool down then make into small ladoos. Once the ladoos are ready dip one edge of ladoo in ghee and dip on pistachios mixture.